I'm going to take this opportunity to talk about a couple of seemingly unrelated ideas and see if I can't develop some connections. "Once it gets off the ground into space all science fiction is fantasy, and the more serious it tries to be, the more naturalistic, the greater its failure, since it completely lacks the moral authority and conviction of a literature won from experience." Perhaps it's my own bias against swords and orcs that posits derision in Ballard's assertion. I mean isn't SF the ideal vehicle for writers to use to step outside their own experience. Can't a writer write with "authority" and even "experience" about places within the realm of the imagination? An interesting perspective on this debate is offered, inadvertently, in the new film Jodorowsky's Dune a very entertaining documentary about the Argentine surrealist's failed attempt to bring Frank Herbert's Dune to the big screen. Jodo is bigger than life, and the perfect spokesman for where SF now has to go as our technology catches up to tech featured in the old pulps. SF must now travel inward. Jodo's already there, man, a spiritual warrior determined to change the world with a film. 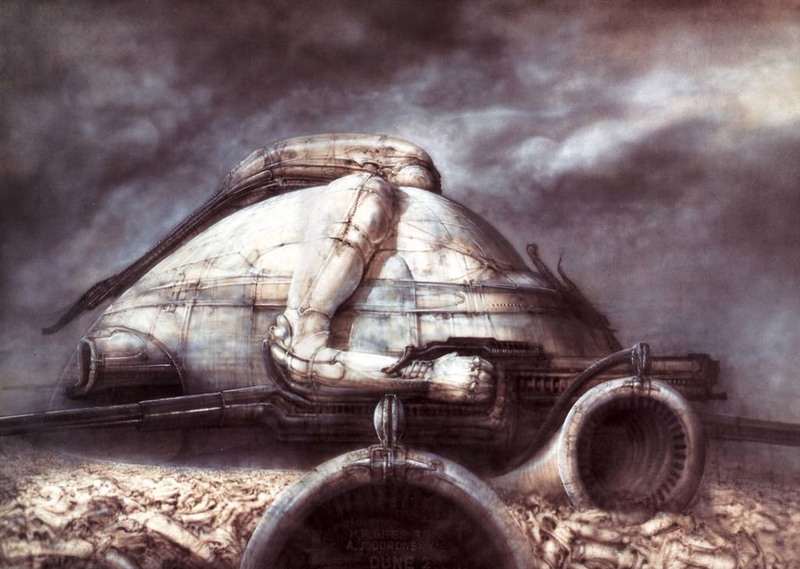 Jodo's Dune would have been stunning with work from Moebius and Giger, music by Pink Floyd and Magma, and appearances by Orson Welles, Mick Jagger, and Salvador Dali. Ultimately it was too much film, too audacious for Hollywood - this was a few years before Star Wars. Jodo is a powerful archetype for this new era of Science Fiction: passionate, animated, driven, filled with a kind of naive arrogance that is increasingly rare. He is permanently outside the boundaries. Where we should all be. In the end Science Fiction, as a genre, is akin to a set of strictures we see in forms like the Haiku. The more we can loose ourselves from these restrictions the more the genre will open to genuine artistic expression, which can never be mere genre. And likewise, Jodo's Dune is a perfect cypher for the current state of SF, which in our opinion is bloated, risk-averse, and in a rut. To exit this rut we must follow our personal vision for things, eschewing the standard tropes, the tired iconography. We must head inward. "On the other hand has emerged a more speculative form of science fiction, one that is crossing the horizon of general fiction at an increasing number of points. Where the older science fiction has been most involved with outer space, this new offshoot is concerned with "inner space," the surrealists' "landscapes of the soul," and in creating images where the outer world of reality and the inner world of the psyche meet and fuse. Indeed, for those writers science serves much the same role as did psychoanalysis for the surrealists - a standpoint rather than a subject matter." I have to wonder if this new form of SF evaporated before it even hit the ground as rain. The current SF market does not seem particularly concerned with inner space, as it does with a kind of neo-liberal outerspace, you know where asteroids are just resources we haven't exploited yet. But there is work at the periphery and we'll continue to toil at the edge of the radar screen.